Is it Possible to Have Too Much Available Credit? Everyone needs food to survive, but eating too much is unhealthy. Exercise is good, but not to the point where your body breaks down completely. Does the same principle apply to credit cards? Can you have so much credit available that it would be dangerous to offer you more? The long answer is: no, as long as you practice good credit habits. The finance industry uses credit scores to gauge the risk involved in extending someone credit. So if “too much available credit” is a thing you need to worry about, then you would expect it to be reflected in credit scores. 1. Payment history — is the consumer making the minimum payment required on time every time. This accounts for 35 percent of the FICO Score. 2. Credit Utilization — is the consumer keeping the balances on their revolving credit (typically credit cards) below 30 percent of their available credit. This accounts for 30 percent of the FICO Score. A consumer can have many credit accounts and a high FICO Score if they are following these two guidelines closely. This means that the number of open credit accounts on your credit report isn’t influencing your credit score one way or another. It’s important to note here that while your credit score doesn’t recognize the concept of “too much available credit,” the final decision on whether to approve you for a new credit account lies with the lender, not the scoring model. It’s possible that you could apply for a card or a loan and be denied because the individual lender has policies related to the number of open accounts or the amount of available credit. Lenders keep their approval criteria close to the vest for legal and competitive reasons, so no one can guarantee that any particular bank or card issuer won’t decline your application based on your current open accounts. But for the most part, you can assume that the simple number of open accounts won’t hurt you. Late payments. If you’re juggling too many accounts, conditions are ripe for forgetting a due date and paying late. As Sprauve notes, the biggest factor in your credit score is whether you pay on time. Failing to do so could cause your score to plummet. High utilization. Having a lot of credit doesn’t necessarily mean you’re using a lot of credit — but it could. If you’re using more than 30% of your available credit on any card or across all cards, you could be headed for a lower score. Opening too many accounts at once. Adding a bunch of credit accounts over a long stretch of time is fine. But when you open a bunch of accounts in a short period, credit scoring models view that as a sign of financial trouble. In fact, 10% of your FICO score comes from new credit inquires. Wait several months between new credit applications to keep your score in good shape. Go slow — one at a time. Get comfortable with each new credit card before adding another. 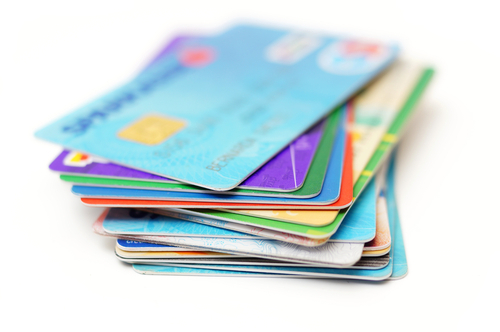 If you’re new to credit, stick with one card for a while. Be sure you’ve got the hang of paying on time and in full before adding more cards to your portfolio. Only apply for credit you actually need. Don’t get sucked in by fat sign-up bonuses and start applying for every card on the market. If you need a new card, apply for one. If not, don’t. Think twice about asking for a higher credit limit. Upping the limits on your existing cards could increase your credit score by lowering your utilization ratio. But tread carefully — if this will tempt you to overspend, it’s probably not worth it. Mind your payment due dates. Maintaining dozens of credit accounts is fine as long as you’re careful to pay on time. Set reminders on your phone or calendar, or automate your payments entirely. Keep utilization under 30%. If you’re managing lots of accounts, keeping your credit utilization in check is key. Having too much available credit won’t hurt your credit score, but you’ll still need to be careful. Be sure to keep the information above in mind!